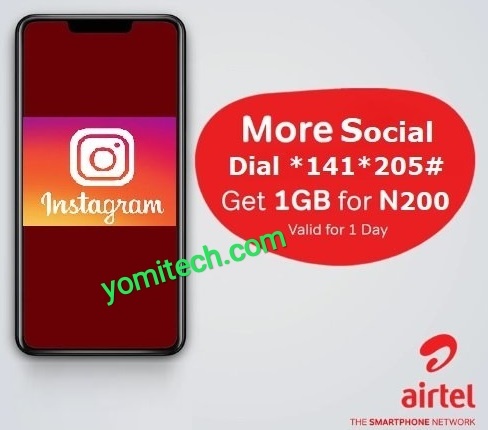 Just like the MTN InInstaBinge which gives you 1GB for N200 to access Instagram, Airtel has also launched its own Instagram bundle which also gives you 1GB data for N200. With the new Airtel Instagram bundle, you will get up to 1GB of data for just N200, but it can only be used to access Instagram App or website. The data plan works on both the old 3G and the new 4G SIM. “Introducing Airtel Instagram Bundles. Stay connected on Instagram all day with 1GB for only N200. Dial *141*205# to activate now”. >> Make sure you have up to N200 airtime on your Airtel SIM. >> Dial *141*205# to activate the Airtel Instagram bundle. >> You will receive 1GB data which is valid for 24hours (1 day).